The bear had moved in for good, and there wasn’t anything Alice could do about it. Not like she wanted to, not anymore. The first week had been more difficult than she had anticipated, but after that things had slowly improved. The bear agreed, in his sure, heavy way, that this was home, this sharing a space together. Home was never about the building. Walls and a roof didn’t make a building into a home, any more than books made a library. Plenty of people have felt more at home at work in a warehouse then where they paid their mortgage. It’s the people that make the difference after all. Alice always felt that animals were more human than those who claim to be. Perhaps the utter guilelessness of them was the difference. Animals never had to prove who they were, never had to bother with such arbitrary things as status and striving. They never wore clothes, never owned cars, never had jobs. Their lives were free from all the distractions that humans had. Like children, they were given all they needed from Mother Earth and Father God. Like children, they learned at their own pace and trusted their senses. They slept when they were tired, ate when they were hungry. They never had to wonder or worry about such arbitrary and nebulous things as retirement funds or investment accounts. And as for in-laws? They never married, so that wasn’t an issue. 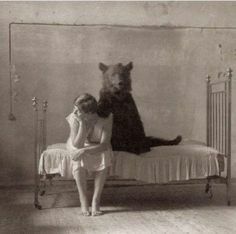 Alice had wanted to marry the bear as soon as he moved in, but he convinced her otherwise. He reminded her that marriage is a human invention, and therefore subject to failure. If you never got married, you’ll never have a risk of divorce. You are free to come and go. Doesn’t it mean more if your partner stays out of love rather than obligation? Every day they stay is a gift rather than a duty. The bear had no name as far as Alice knew. She had asked and he’d not said. He didn’t talk like humans did, of course. He made his thoughts known in the way all creatures did in the beginning, with the spirit. He spoke with his whole being, resorting to sounds only as a last resort. Then they were usually snuffles and sighs and grunts. Only once had he growled, and that was when Alice had mistakenly opened a door onto his paw. After that they’d agreed to remove all of the doors inside the house. Doors just fostered separation and exclusion anyway. Plus, the knobs were hard to work with paws. The house had to work for both of them or it wouldn’t work at all. The bear didn’t need a name, not really. He knew who he was. He was the only one Alice would be calling. Names meant very little when the group was small. She rarely had to call him anyway. He always knew in his slow sure way when she needed him. The same was not true for Alice, not yet. The bear often wanted to call her to look at an especially beautiful flower or sunset, but she was often so distracted by chores that she couldn’t hear him call to her heart. She spent a lot of time cleaning because wanted to keep the house just so. She forgot (or never knew) that the bear didn’t need to be impressed and nobody else who would come by would care. Few people visited their home. Most of her family thought she was crazy for wanting to live with a bear. Her mother even talked about having her committed, but since she was an adult and seemed sane in all other respects, she let it drop, choosing to hold her judgment. She was prepared to shake her head and say “I told you so” while bandaging her daughter’s arms from the inevitable claw marks that surely would come, but they never did. Months went by and the bear and Alice got along like peanut butter and jelly, always together, and always good. Her mother still wasn’t one to concede the battle. Decades could’ve gone by and she still would not admit that perhaps Alice had chosen correctly. Little did she realize that Alice hadn’t done the choosing. The bear had. He knew Alice needed him as much as he needed her, knew that it wouldn’t be long before she’d hear him in her heart the way he heard her. Their first meeting was as you’d expect. Bears aren’t normally sought after. Normally they are run from. Alice had decided to spend a week camping by herself in the Smoky Mountains. Her job wasn’t fulfilling, and she was estranged from her family in part because they felt she was wasting her talents. She decided week away to really listen was what she needed to get back on track. Her family had paid for her college education, where she had studied veterinary science. But when she graduated and found a job at a local vet’s office as an assistant, she quickly learned that what you learned in the textbooks often doesn’t match with reality. It was far more visceral than she ever could have imagined. In her first week she saw more of animal’s insides than their outsides. It wasn’t all physical. She’d always been a little empathic, able to feel how others were feeling even before they had words to express them. She was often able to help people before they even knew they needed it. Her friends liked her because they always felt at ease around her. She just made life easier. Meanwhile they never knew how much work this was for her. When she was at the vet’s office, she was overwhelmed with the messages of hurt and pain that she received from the animals. She had not factored in that all of them would be constantly broadcasting their hurt and confusion and pain. It was an unrelenting onslaught, since even the healthy animals that were brought in just for a check-up or a shot were anxious and confused as to what was happening to them. When she quit after a month, her family felt she was throwing away everything she had worked for. Worse, they felt she was throwing away everything they had paid for. They refused to support her any further, so she took a job selling perfume and cosmetics at the local mall to pay her bills until she could figure out what to do next. It was not long after that that she went on her trip. While praying for guidance late one night around the campfire, she distinctly thought she heard a voice say “Take me in”. Usually she had perceived God’s voice as more of a feeling than actual words, but this was crystal-clear. It was so clear that she thought that perhaps it was an actual voice, so she looked around. Just outside the glow of the fire, she saw the distinctive gleam of eyes in the shadows. They were three feet from the ground, so she knew that it wasn’t an adult. She didn’t realize it was a bear until he stepped forward into the firelight and stared at her, saying again “Take me in”. She ran, stumbling over tree roots and tent stakes to get away. She spent that night sleeping in the fetal position under a rhododendron bush about a mile away from her camp rather than risk being near that bear. Little did she realize but he had followed her at a slow walk, and watched over her all night as she slept to make sure that no other creature could approach her. Not all forest creatures welcomed humans into their midst. She awoke with the dawn, stiff from rocks and roots pressing into her side. Her first thought was to give up on her quest and walk back to her car, but her keys were in her tent. She hoped that the bear hadn’t savaged her camp, shredding everything in a quest for food. She’d heard stories of bears that tore through everything in a quest for sausage or Snicker’s bars. The idea of rummaging through her ripped-up belongings to find her keys was not appealing, but she had no other choice. When she finally returned she saw that everything was just as she’d left it. She had to use a hammer to re-secure the ropes from the tent pegs she’d tripped over on her midnight flight, but other than that, everything was the same. She started a small fire to cook her breakfast, and while drinking bitter coffee and eating oatmeal with blueberries she’d picked the day before, she heard the voice again. “Take me in”. She looked up with a start and saw the bear, but this time he was sitting twenty feet away, staring at her. This was enough distance that she felt she didn’t have to run. If she’d studied bears in college, she’d have known that no distance is a safe distance with bears. They may seem amiable and too large to run quickly, but looks are deceiving. The bear repeated his request. “Take me in”. “What? Why? Who are you?” Alice rambled on, picking up courage. She hadn’t had time to question that she was speaking with a bear. If she had, she would most likely have been silently staring at him, wondering if maybe her mind had finally cracked. Over the course of half an hour the bear explained who he was and why he was speaking with her. He said things about being her protector, her teacher, her friend. He said he was her great-great-grandfather reincarnated. He said he had always known her and watched over her. He said that he could teach her to be the best veterinarian there ever was, or ever could be. He said that he would work with her, but first she had to let him into her life and into her heart and home. They talked more over the course of the week she was at her campsite and worked out a plan. It was difficult for Alice to fully understand him but her natural empathic abilities went a long way. At the end of the week she went home, leaving the bear there, but she promised to return. She quit her meaningless job as soon as she returned, not even bothering to go in to turn in her notice. She called the assistant manager at 7 on a Tuesday morning, waking him from his hangover from his one-person-party the night before. She told him that she had quit, and that was that. She hung up as he stuttered his questions at her, not believing. He’d never listened anyway. She sold everything she had to make enough money to move to the woods and build a small cabin there for her and the bear. It was fortunate that she didn’t need much, because she didn’t have much. She traded out for much of what she needed by going to the Goodwill. Her worldly possessions transformed from frilly dresses to sturdy cotton clothes, the better to work in. Her CD collection became an axe and a saw so she could cut down trees to make a home. The bear worked with her, pushing trees down, dragging logs over, lifting them up. After a month they were both tired but there was a roof over their heads. They had no furniture but they didn’t care. The work was so exhausting that they didn’t need a fluffy bed to rest in. They both slept deeply, curled up on the earthen floor of their new home, the bear curled protectively around Alice. She loved the musky, earthy smell of his fur and how it was somehow soft yet bristly at the same time. At times she could smell pine sap and warm summer sun in his fur, traces of his adventures while away from her. They spent much time working together, he teaching her about all the ways of the animals. He filled in all of the knowledge she’d missed in her classes. He introduced her to all the animals in the forest and taught her how to speak with them – but more importantly how to listen. He told her that she didn’t have to wonder what was wrong when they came to her – they would tell her if she asked. Yet still there was a wall between them. She had learned the language of the birds and the deer, of all the animals that flew or walked or slithered. Yet she was never fully able to hear the bear, not as well as the other animals. Perhaps he was too different, too tame. Perhaps he’d given up part of his wildness for his ability to live with her. Perhaps there was still too much of his human spirit in him, buried deep down in his bear heart, for her to hear him like she could hear others. He wasn’t quite a bear, yet he wasn’t quite a person, but both, and neither, and something more. This entry was posted in Stories and tagged bear, black and white stories, empathic, empathy, hearing with your heart, voices. Bookmark the permalink.